Fredrik Zetterström has established himself as one of Scandinavia’s leading baritones of today. Born in Stockholm, he received his musical education at the University College of Music and the University College of Opera in Stockholm and with Prof. Birgit Stenberg. Since his debut he has been engaged by most Scandinavian opera companies and has also performed at the Brooklyn Academy of Music in New York and at the Chicago Opera Theater. Fredrik Zetterström has been noted for his performances in a wide range of roles in a repertoire consisting of works from the baroque to the most contemporary. Roles to be mentioned are; the title role in Rigoletto, Germont in La Traviata, Escamillo in Carmen, Enrico in Lucia di Lammermoor, Leporello in Don Giovanni, the Count and Don Bartolo in Le Nozze di Figaro, Pantalone in L’amour des trois Oranges, Marcello and Schaunard in La Bohème, Jago in Otello, Don Pizzaro in Fidelio, Don Profondo in Il Viaggio a Reims, Valentin in Faust, Figaro in Il barbiere di Siviglia and the title role in Eugene Onegin. Fredrik Zetterström is a frequent soloist in concerts and has appeared with the Swedish Radio Symphony Orchestra, The Gothenburg Symphony Orchestra, the Norwegian Radio Symphony Orchestra, the Norrköping Symphony Orchestra and Turku Symphony Orchestra in Finland. He has appeared in the world premieres of works by the Swedish composers Daniel Börtz, Thomas Jennefelt, Sven-David Sandström, Knut Nystedt and Karin Rehnqvist. With pianist Thomas Schuback he recently performed the song-cycle Klangernas sånger, a work dedicated to the duo by composer Daniel Börtz. Highlights in 2002/2003 were Germont in La Traviata and Harlekin in Ariadne auf Naxos at Malmö Opera. In 2003/2004 Fredrik Zetterström sang Jago in Otello and Marcello in La Bohème, both at Malmö Opera, as well as Don Profondo in Il Viaggio a Reims at Chicago Opera Theatre. In the season 2004/2005 Fredrik added three new roles to his extensive reperoire: Figaro in Il Barbiere di Siviglia for Norrlandsoperan, Valentin in Faust at Malmö Opera and Dr Bartolo in Le Nozze di Figaro at Chicago Opera Theater. In 2005/2006 Fredrik Zetterström sang Leporello opposite Håkan Hagegård as Don Giovanni at the Värmland Opera and Il Conte Almaviva in Le Nozze di Figaro at Malmö Opera with conductor Arnold Östman. In 2006 Fredrik sang his first Rigoletto at Folkoperan in Stockholm and later in concert with the Helsingborg Symphony Orchestra and Pier Giorgio Morandi. In 2007 came his first venture into the Wagner repertoire as a sensational Amfortas in Parsifal at Värmland Opera, followed by Valentin in Faust both at the Gothenburg Opera and at the Malmö Opera as well as Den Jyske Opera in Århus, Denmark and Marcello at Det Kongelige in Copenhagen and at the Gothenburg Opera. In the season of 2008/2009 Fredrik sang his first Jochanaan in Salome with Dame Gwyneth Jones as Herodias at the Malmö Opera, as well as his first Scarpia in a prestigious Tosca-project in Uppsala performed in the city’s Cathedral and Old Castle. Later that year he sang Marcello in La Bohème at the Gothenburg Opera, the role of Escobar in the world première of John Forsell’s Death and the Maiden at Malmö Opera, Balstrode in Peter Grimes for Norrlandsoperan and Xavier in Daniel Börtz’s new opera Goya, a work commissioned by the Gothenburg Opera. 2010/2011 included Jago in Otello in Uppsala, role debut as Posa in Don Carlo at Gothenburg Opera, conducted by Christian Badea and Wotan in Das Rheingold and Der Wanderer in Siegfried in the critically acclaimed complete Ring Cycle at Värmland Opera in Karlstad. Later that season Fredrik went to the Copenhagen Opera to sing Alfio in Cavalleria Rusticana and Canio in Pajazzo, starring José Cura. During summer of 2011, Fredrik sang Giorgio Germont in a production of La Traviata at Teater Hedeland. In fall of 2011 Fredrik made huge success with his interpretation of Wozzeck at NorrlandsOperan for which he was awarded the prestigious OPERA Magazine’s prize . The production was conducted by Roland Kluttig and directed by Bogdan Zsyber and Carina Reich and was also broadcasted on national TV. 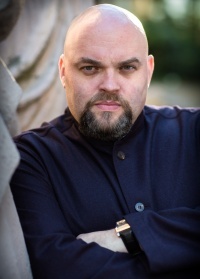 In 2012, Fredrik made his debut at the Royal Opera in Stockholm as Scarpia in Tosca, with José Cura as Cavaradossi. In November he sang his first Renato in Un Ballo in Maschera , directed by Tobias Theorell and conducted by Pier Giorgio Morandi, also at the Royal Opera in Stockholm. Among further recent and upcoming engagements to be mentioned are the title role in Aribert Reimann’s Lear, Faninal in Rosenkavalier, Amonasro in Aida, Rigoletto, Markis de la Force in Dialogues of Carmelites, Golaud in Pelleas and Melisande, Trinity Moses in the Rise and Fall of the City of Mahagonny and Barnaba in La Gioconda.